Come to Me, all of you who are weary and burdened, and I will give you rest. Today in church we sang a song titled Come to Me. Come to me, I’m all you need. Come to me, I’m your everything. Christ followers know this. I grew up in a small Southern Baptist church where we read the King James Bible and sang from hymnals. I remember reading that Bible verse with the words “Come unto me“. We sang the old hymn by the same name. “Come unto me, and I will give you rest. Take my yoke upon you, hear me and be blessed”. (OK, how many of you have that one stuck in your head now?) My point is that this is common knowledge for Christians. We are to cast our burdens before the Lord. He invites us to lay the load at His feet and find rest. Yet we don’t. Why??? The sermon this morning in church further reminded me of my need to run to God. One point in particular stuck out for me…so much so that I took a screen shot of it and posted it on social media. I love this and so needed to hear it. 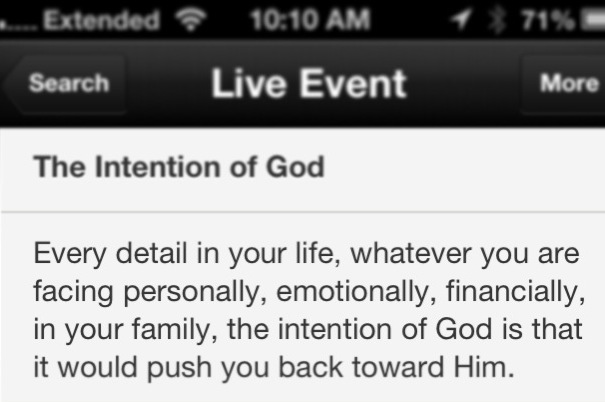 God’s intention is that every detail in my life should push me back toward Him. Again, I know this, but knowing and doing are totally different things. The message and songs today hit me like a ton of bricks. Why am I getting nowhere in dealing with my struggles and issues? Because I’m dealing with them and not turning to God. Sometimes it takes something like the right message or song at the right time to make you stop and think about things. I’m so thankful for God sending me the message I needed to hear, and I’m thankful for a church that delivers His Word week after week. I know what I need to do and will heed the words of today’s message and the words of Christ. Come to Me. Isn’t it cool how God works? He puts you right where he wants you. Loved this post, thank you and God bless! Yes, it is amazing how He works & speaks to us. Thank you for your kind words.